Jesus of Nazareth, will also be present to guide the donkey to the steps of the Sanctuary. 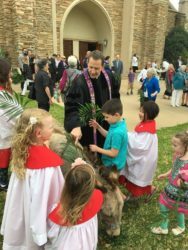 Participants will be given palm branches to wave as Jesus comes into the gates of “Jerusalem” and the worship service. After worship, the Christian Education Committee is sponsoring a simple lunch to herald the Spring Festival, highlighting Holy Week. We’ll have bounce houses, plasma cars for riding up and down the sidewalk, yard crosses to paint, egg dying and Easter Egg Hunt (first hunt). The 2nd Easter Egg Hunt will be on Easter Morn, April 21, right after Sunday School, 10:30 a.m. Stuffed Easter Eggs will be collected starting post Spring Break. We are COLLECTING STUFFED EASTER EGGS—about 100 dozen at least — for 2 Egg hunts. Collection baskets are by Parish Hall, Church Office, and in Sanctuary! Need by Palm Sunday Morning, April 14!